We drove the caliper and were somewhat impressed,, but then we woke up and realized we would have the trouble Chrysler is infamous for,,, we PASSED and went to the Toyota dealership. 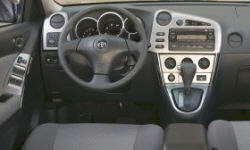 Why the 2006 Toyota Matrix? First - irregardless of the negative press our country have been throwing at Toyota, this manufacturer have proven themselves to be #1 in dependability and lowest CPM year after year after year. IMHO the negative is shamefully 100% BS in an effort to swing US buyers away from the so much better and time proven Asian imports. 2) Ease of entry and exit, spacious rear seating, driving fun and the performance is more than adequate, AWD is perfect for our Pacific NW winter driving, hatchback is so convenient for our needs, fold down rear seats another HUGE PLUS!, attractive styling, we're not selling but the resale is and will be excellent. We purchased our Matrix NEW June of 2006, we now (21 Dec 2012) have 82,000 miles and I have monitored the mileage since we purchased the car. We get 24 in city driving and the VERY best we've got on a long freeway drive was 30mpg. Overall our mileage for the 80,000 miles is 27 which isn't great but is acceptable. We've seen reviews saying there is "excessive" engine noise - my wife and I disagree 100%. People, this little inline 4 sits inside a noninsulated engine compartment - if we want super quiet go spend $40k or more for a full on luxo sedan. The Matrix never professed to be a luxury car nor a race car. But, it does hustle around town from store parking lot to store parking lot and from stop light to stop light with all the traffic with ease and no unnecessary mashing of the throttle to do it. Accellerating to speed and entering any freeway with ease. It can accellerate from 65 to 80 when we need to pass, SAFELY and as quickly as is required with no need to fret it will not deliver. The FIRST thing that impressed me about this little car was the ease of entry to the drivers seat and overall visability in all directions. Adjustable side morrors from inside the car is not a new feature but it was my first and it works GR8. Rear seating is very comfortable and has more than spacious leg room. Our Son is 6'2" and has more than once said he's so impressed with the room he, his wife and our grand daughter have when they go somewhere with us. The fold down rear seating has been a God send for us more times than I can say. This catagory is the #1 reason we looked at Toyota when we were new car shopping in 2006. Dependability and Resale. As I mentioned earlier, we're at 82,000 miles and have kept on top of the manufacturer suggested regular maintenance - oil/filters changes, transmission/transfer case fluids changes, coolant and refrigerant changes, brakes at 45,000miles, etc. We have had 100% dependability with this little rascal and it has NOT failed to start and give us a ride,,,, ever. 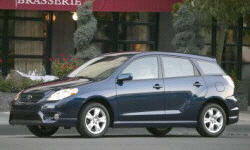 The Toyota Matrix delivers what we had hoped and what we expected it would. Why Not the 2006 Toyota Matrix? Honestly - I have read each and every catagory this site suggests and there is absolutely NO "CON"s I can share for this car. I was not disolutioned when we first bought the car. I did not expect it would be a luxury car - it cost $17000. I did not expect it would be a race car - it cost $17,000 and has an itty bitty 131CI inline 4 cylinder engine with AWD and an automatic transmission. Come on folks, the little Matrix didn't intend to be a power house. What the Toyota Matrix is - is a relatively inexpensive, slightly smaller than full size sedan, economical and dependable. It delivers the costs per mile (CPM) Toyota are famous for. PLEASE do not buy into the negative ads, they're BS!